KFC, Kraft Mac & Cheese and BarkBox celebrate Mother's Day with a comedic touch. Every Mother’s Day, brands bombard people with sentimental messaging, but this year some of the most creative ads celebrated the holiday with humor. KFC’s Colonel Sanders is the love interest in a romantic novella, Kraft Mac & Cheese teaches mothers how not to curse in front of their kids, BarkBox raps about dog moms and Brawny makes light of all the messes moms have to deal with. And while Carhartt’s spot is not comical, it squashes stereotypes about the day. One brand that was trying for funny but didn’t quite hit the mark is Skittles. While it’s nice to feel close to your mother, this disturbing spot just makes you want to barf up your Skittles. Here are the five most creative Mother’s Day ads of 2017. We hope they make you smile. Who says Mother’s Day ads always have to center around kids praising their moms? After all, moms have desires outside of their children. KFC took this Mother’s Day to fulfill moms’ fantasies with "Tender Wings of Desire," a 96-page finger-licking, romance novella that features the Colonel as the love interest. The fast food giant worked with Wieden + Kennedy Portland on the saucy book, presented as a tome written by the Colonel himself. 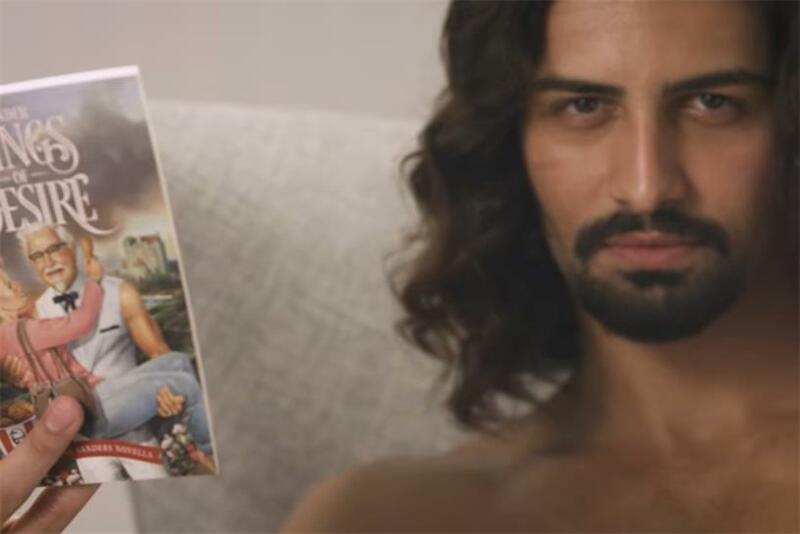 In a 58-second spot, a shirtless, long-haired man reads from the novella, seductively licking his fingers to flip between pages. "Sometimes it seemed as though the two of them had been made to love each other, and they tried to do so at every given opportunity," he reads. A picture of KFC’s $20 "fill up" fried chicken bucket appears in a frame on a table beside him. "Don’t you wish you were a mom?" he asks as an off-camera fan blows his hair back. The book follows the story of a Lady Madeline Parker who, on the heels of a loveless betrothal, runs away from Parker Manor. Soon she meets Harland, a "handsome sailor with a mysterious past." Parker is then caught between duty and her passion for the Colonel. "Tender Wings of Desire" can be purchased on Amazon for $0.99. "Mother’s Day is KFC’s best-selling day of the year," explained the brand in a statement. "Paired with a $20 Fill Up featuring KFC’s Extra Crispy Chicken, mothers can finally get what they want this year—a family meal they don’t have to cook, and some alone time with a captivating novella." Melissa Mohr, author of "Holy Sh*t: A Brief History of Swearing," is the influencer Kraft Mac & Cheese chose for "Swear Like a Mom," a hilarious Mother’s Day campaign created by CP+B Boulder. In a 1:35 video, the author discusses a recent Kraft study revealing that 74 percent of moms admit swearing in front of their kids. "If you’re one of the 26 percent who say they have never sworn in front of their kids, you are full of [beep]," says Mohr whose mouth is covered by a macaroni noodle as soon as she says the expletive. She goes through some strategies parents can try to avoid shouting out obscenities. For instance, when kids are "running around like caffeinated gorillas" say "what the frog, you’re acting like flipping goof nuggets" instead of what you really want to say, she explains. Since May 2, the video has generated 2.6 million views on YouTube. The accompanying website, swearlikeamother.com, serves as a place where kids can go to download silly Mother’s Day cards to make their moms feel better about their potty mouths, and where mothers can buy "fail cancelling ear plugs" that look like little noodles to place in their kids’ ears when situations gets especially bad. A 19-second video show these ear plugs at work. In case Mohr’s "kid-friendly" antics don’t work, "there’s always Kraft Mac & Cheese," reads the website. Some people treat their pooches like children. Subscription service BarkBox wanted to create an anthem for "all the women who love taking care of their pups like lady bosses," the brand said in a statement. In a Facebook video, T-Spoon and ZZ Tophalf, both creatives at BarkBox, rap about what it means to be a dog mom. "If you’re a dog mom, put your hands up," rap the duo. "This songs for all the ladies who provide for their pup. When you’re a dog mom it’s just what you do. Cause they say you’re not my baby, but I know it ain’t true." As ridiculous as the song may be, the number of views the video has seen is no joke. After four hours of being online, the video garnered two million views, and at the time of publication, it has 15 million views. BarkBox, which created the music video in-house, also made the rap downloadable on its website. Mother’s Day is typically connected with breakfast in bed, flowers and sentimental messages, but in workwear brand Carhartt’s first national Mother’s Day ad, it shatters those stereotypes. "All Hail the Carhartt Woman" is a one-minute spot created in-house that features real mothers who are compared to the legendary "Rosie the Riverter" by a child narrator as they go about their own hard work. Having been around since 1889, Carhartt was there in the 1940s when "Rosie" became a symbol for women who could do a "man’s work." In this Mother’s Day spot, shows the spirit of "Rosie" lives in modern times. "The Carhartt woman is the new revolution of the legendary "Rosie the Riveter" icon and she can do it all," said the brand in a statement. "While the film is certainly an ode to moms everywhere, it's meant for any woman, man or child, who comes from a strong woman." The spot is running on broadcast Mother’s Day weekend on HGTV, DIY and USA Network as well as social media. In another 15-second ad, a girl hands an arrow to her mother practicing hunting. The hashtag #AllHailMom" complement the videos. From tantrums to food fights, mothers deal with messes every day. Brawny strapped Snapchat Spectacles to the children of four real families to show the struggles moms go through from the perspective of kids. A 52-second ad created by San Francisco agency Cutwater, show mothers fixing boo-boos with Band-Aids, getting splattered with spaghetti and getting run over with toy cars through the Spectacles’ fisheye lens. The video ends with, "Once a mother, always a giant." "Motherhood in particular can be a challenging time, and we wanted to highlight the strength and resilience that women have during this period through the perspective of their children," said Chuck McBride, chief creative officer of Cutwater, said in a statement. "'Once a mother, always a giant' seemed like a simple way to articulate this point of view, while celebrating women for the strong and resilient people they are."